Originally we were scheduled to shoot for Conde Nast traveller in Rajasthan 6 month’s prior. We were to shoot a pilot for my TV show named nomad traveller, but my crew and I were hostages at the taj hotel Mumbai terrorist attack, and our plans were derailed. After 8 month of healing we decided to do our Rajasthan photo shoot and pilot for our TV show nomad traveller. We settled on the exotic city of jodhpur and the stunning Umaid Bhawan palace. Still home to the Maharaja of Jodhpur. My city guide to Jodhpur can be read online here. 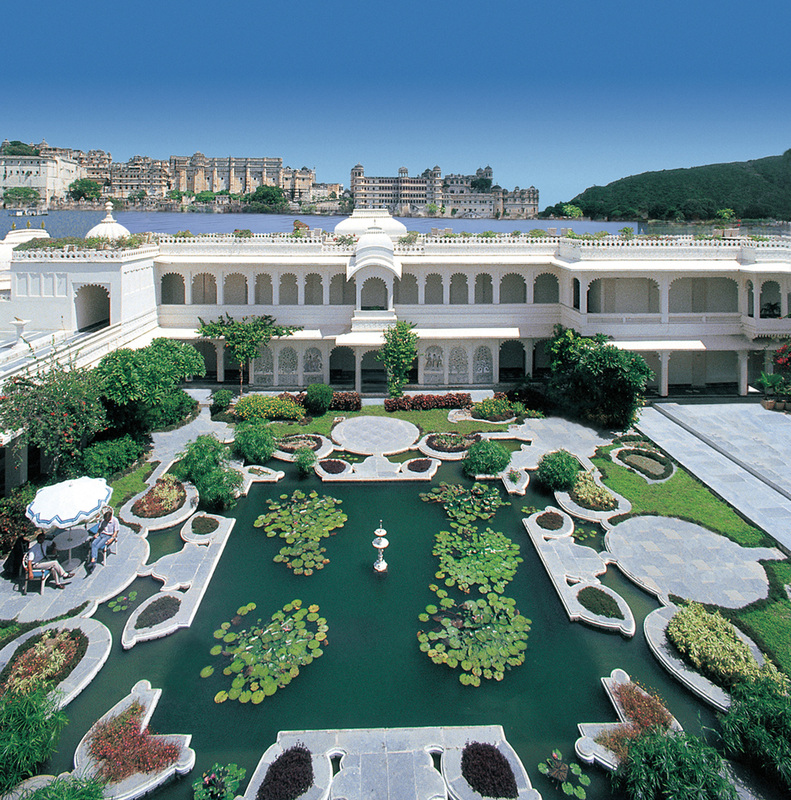 The Taj group leased the palace from the Maharaja, who maintains a private wing. They have restored the palace to its original glory and is a must to visit on your trip to India. It’s like stepping back in time, to the 1920s and 30s and the send of a Hollywood movie. It’s a mix of Art Deco and Indian Ray style. It is one of the grandest buildings in the world. It took 15 years to build and 4000 workers and is considered the last great palace built in India. The shoot idea was to create a modern version of a Maharani and capture the elegance of a bygone era. I was inspired by the portraits of the Indian royal families from that time, which were extremely glamorous and mimicked the Hollywood movie star portraits of George Hurrell from the 1920s and 30s. It was obvious that the Indian Royals were obsessed by everything Hollywood, from fashion to furnishings to architecture. I shot it all in colour and muted the colour to represent the faded glory of the glamorous era. We case India’s super model Ujjwala Raut, who was Tom Ford’s at YSL. She is extremely graceful and elegant, but also a lot of fun to have around. I lit the entire shoot with a 3.0 Octabank and some spotted rim lights and fill lights to fill the rooms. We de-saturated the colours and shifted the blacks to browns to add an antique feeling. We shot in and around the hotel using the Maharaja’s private car collection. One of the cars was a solid silver Rolls Royce from the 1920s. One of my favourite shots was in the very glam Maharani’s bedroom suite. It looked like something out of a Cecil B DeMille film. These images are from Jaswant Thada, a memorial up by the lake with local dancing women. On our trip we also shot at Sardar Samand, which is the Maharaja’s hunting placing, and now a nature reserve. This is a very pretty sandstone place perched on a hill with 360-degree views of the reserve. We interviewed the Maharaja and discussed his role as a Maharaja in current times. He also told us a lovely childhood story of how he used to love roller-skating around the palace and being chased by his nannies. Jodhpur is called the blue city as it was predominantly the Brahmin cast and they painted their houses blue, but there is a also story that it helps to keep the mosquitoes away. On one of our down days we took a tuk-tuk, which is a type of rickshaw through the narrow streets of The Blue City and up to the Mehrangarh Fort. On the way we passed all the little shops filled with exotic things to wear or eat. The bring colors of their wares seemed electrified against the cobalt blue of the city streets. Click here to view my video guide to the top ten things to do in Jodhpur. When we were half way up the hill there was lots of commotion on the narrow streets. Then suddenly the sky was ominously darkened and one of the local shop owners shouted for us to take cover as a sand storm was coming. We looked out across the desert sky and saw the wall of sand coming towards us. We’d never seen anything like it. We all covered our eyes, noses and mouths with scarves as the sand filled the air around us. The driver kept going through the streets to try and find refuge. But it passed as soon as it came. It was eerie but fantastic and exhilarating. I’ll never forget the visual of the storm approaching and the silent stillness that came before the roar of the sand flying around us. Udipur is one of my favorite places in the world and is known as the Venice of India . It was the summer palace for the Royal Family and was leased to the Taj Hotel group in the early 1970s. 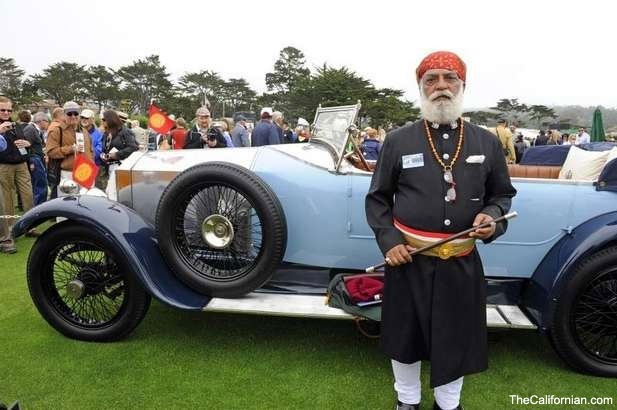 The maharaja of Udipur is one of India’s most eccentric Royals, racing his vintage Rolls Royce’s wearing full Maharaja regalia in the Dakar car races. He even has his own record label. 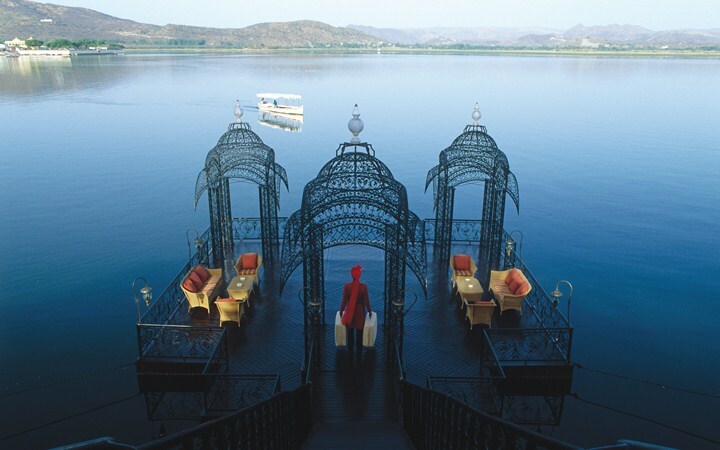 I first visited the lake palace as a young girl and memorized by its unique beauty, I said to my mother that I’d like to get married there when I grew up. It’s stunning and was used as a location in the James Bond film Octapussy. Remember the pool scene with all the galm women frolicking around Roger Moore? This gives the Taj Floating Palace double the appeal since I’m such a huge James Bond fan. I’ve shot there with Elizabeth Hurley for her swimwear collection ­and have visited numerous times. You are met at the airport in a fabulous vintage car and then transported to the lake where an equally stunning vintage barge takes you across the water to the entrance. When I shot the Taj Palace Hotel campaign a few years ago, I mentioned this to Pritti, the Taj Hotel PR Manager, who said shed throw the party there when I get married…so there is still hope! For my guide on places to see, shop and stay in Udaipur and Rajasthan visit Daniela Federici Modern Nomad. Istanbul is a perfect blend of old and new. Its exotic skyline mixed with its super hip art and culture scene makes it one of the coolest cities in the world and one of my favorites to visit. We were doing two shoots for the London Telegraph supplement with style editor Daniela Agnelli. One story was postcards from Istanbul, using all the landmarks and the other a 1920s story at the Art Noveau, Pera Palace Hotel. 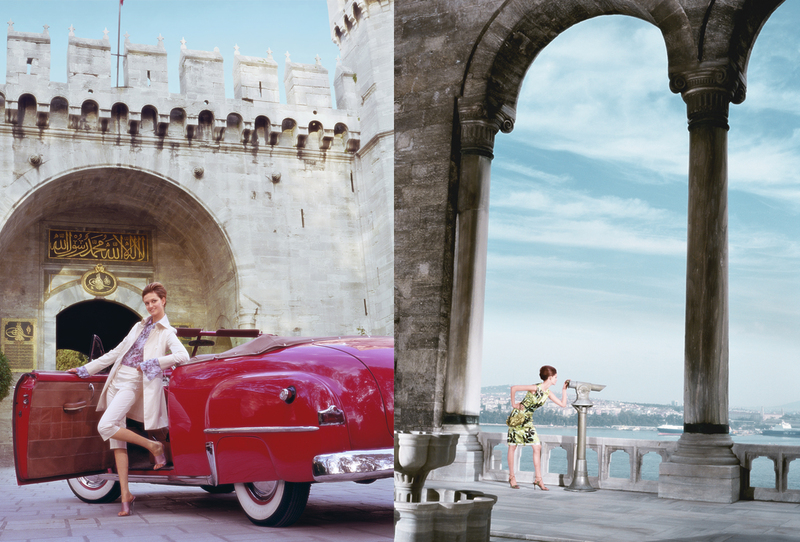 Postcards from Istanbul were using 1950s inspired clothes. We shot it like the 1950s Hitchcock films. Very flat and we pastelized the colors to give it a sense of the period. We shot at the stunning Aya Sophia one of my favorite buildings in the world. Then we chose one of the ancient Hamans, which look like a scene from Arabian nights. This was tricky as the lenses kept fogging due to condensation. We learned that we needed to let the lenses acclimatize by giving them an hour to adjust to the moisture. The next location was in and around Topkapi Palace where we managed to convince the female palace manager that we were doing something elegant and a good promotion for the palace. Its funny how in ancient times the Sultans mother ran the palace and this woman was a modern version of that. She had all the power and looked as stern as a Sultans mother. Once approved we shot a fantastic 1950s car at the entrance gate, followed by a shot in the Harem. The Harem is where the Sultan kept his wives and family members and only accessible to women and the Unics who looked after them the unics were from Africa and had their gentiles removed before engaging in work at the Harem. The interesting thing about Ottoman culture is that the Sultans couldn’t take Christian or Muslin women as slaves or concubines so they used to journey to the Russian boarders and choose the most beautiful girls. They then educated them in Literature, music, dance, the arts and social etiquette before they were introduced to the Sultan. He then had his way with them. But as long as the girls were on the good side of his mother, their lives were fairly good. They had freedom around the palace and went on the occasional journey outside. There was lots of competition in the Harem for the girls to be the Sultans number one. There are stories of poisoning and if they had bared a son, some of the other wives would attempt to poison the mother and son. For this reason the famous Gold Cage was built to protect one of the princes. The second story was a romantic Marlene Dietrich inspired shoot at the nostalgic Pera Palace hotel. This area of Istanbul is an up and coming artsy neighborhood. The hotel was part of the Orient Express Hotel group and people who took the Orient Express train from Venice to Istanbul were encouraged to stay there. We shot in B&W sing pools of light to highlight the clothing and architectural details using prophoto 7B packs and heads. I loved the styling and ambience of the hotel the wonderful old cage elevator was beautiful. I love Istanbul and try to visit every year to attend one of their cultural calendar events ranging from the Art Biennale to a charity event. While I was having lunch with Mark Connolly, Fashion Director for Condé Nast Traveler, he smiled mischievously and said, ‘I have a shoot that would be perfect for you! What do you think about shooting a model looking like a tropical bird, zip-lining through the Costa Rican rainforest?’ My eyes lit up as I responded enthusiastically, ‘Yes sounds like an adventure’. Mark was excited and he didn’t know any other photographer who was game. He explained his vision was to style the model like an exotic tropical bird mixed with an Amazonian princess, flying high through the rainforest canopy. I immediately thought of one of my regular models Nanda, a model with an exotic mix of American Indian and Thai. We needed someone who looked the part but also would embrace the idea and not have a fear of heights. Arriving in Costa Rica, the crew drove up to the Vista Al Golfo Lodge. A surreal Tyrolean-looking building that appeared as though it had been transported from the Swiss Alps. Not at all what you would expect to find in Costa Rica. The property had spectacular views down the mountain towards the coast. And the restaurant courtyard hosted a huge fig tree, which felt like something from the film Avatar. We felt spiritual tucked in her embracing branches watching the sunset. The first day was spent scouting and getting familiar with the zip-lines. Once you begin your decent, there is no getting off until the end. We flew over 30 lines and 11 waterfalls, hundreds of feet above at great speed. This was exhilarating and going to be an incredible shoot. On the shoot day, Nanda looked amazing. Dawn, the make-up artist, drew Maori style tattoos onto Nanda’s arms and braided her hair creating a Mohawk. Mark created vividly colored, feathered Mohawk headpieces to emphasize the look, which brilliantly complimented the Rodarte and Manish Arora garments. Our guides, who regularly worked on the zip-lines, carried backpacks with clothes and lights. Whenever the model needed to change on the platforms, the guides would politely turn their backs. Nanda was brilliant and would quickly strip under a big sheet. This shot was taken at the end of the day at sunset and you can see a zip line in the distance. This zip line is separate from the main ones as it’s the longest and fastest going up to 45 miles per hour. We shot using the sunset as a rim light and a magnum dish on a 7b for the key light. This was to fill the foreground and darken the sunset. Another of my favorites was the image with the horses. We woke early this day to get the morning light through the trees… The horses live in the stables on the property and are used to take people up to the zip lines. The property is known for its horse riding and zip-lining while we were there one of the horses gave birth, which was quite phenomenal. In this photo, we added a blue gel to the light and smoke to feel like morning mist on the water. The horses stayed quite still and I snapped this shot as the far left horse turned its neck adding a sense of movement. I shot using my Nikons and Profoto 7B’s with a series of grid spots. We were intending to shoot the story in the exotic desert cities of Rajasthan, for CondeNast Traveler USA with the brilliant and talented fashion director Mark Connolly. The shoot was to be featured in my TV series Nomad Traveller, about photography, travel, art, architecture and design. However as fate had it, my film crew and I had arrived at the Taj Mumbai, minutes before the terrorist attack. We were held hostage for days and some of the crew were shot at. We escaped by smashing through windows in the ballroom, tying the long curtains together and sliding down 30 ft to the ground. We managed to get 60 people out but were exhausted and traumatized. Even though I was living in NYC, I returned to Australia to spend time with my son and partner who were vacationing there. Mark was still in NYC, and needed to shoot the editorial. He called me in Sydney and asked if I was interested in shooting the story in Broome Australia. He flew 40 hours to get to Broome, which showed his remarkable loyalty and support. Broome is visually spectacular and is located on the furthest western tip of Australia. It’s an old pearling town and Australia’s equivalent of the Wild West. It has a unique color palette of red, blue and green. The desert is red from the Pindan mineral. The Ocean has a greenish turquoise color and the blue is from the vibrant blue sky. It was founded in the early 1900s as a pearling town and the wealthy settlers enslaved the Aboriginals to dive for pearls. With the abundance of pearls the Chinese and Japanese divers soon followed. The main street had a pub on every corner, a bank and general merchandise store and was notorious for its decadence, prostitution, drinking and gambling. This was juxtaposed with the very proper Victorian morality of the sea captain’s wives. Broome is still home to some of the biggest pearl companies in the world. I had shot the Paspaley Pearl campaign who are based there and supply the world with most of its high-end pearls. I made a quick phone call to Clare Paspaley, who generously suggested we take their magnificent Mallard Sea Plane, to see the remote pearl farms. Mark wanted to create a character that resembled a Hitchcock woman dropped in an Australian Desert Outback Town…A little disheveled from the desert heat. We cast the wacky Australian model Elyse Taylor, who was brilliant. An Aboriginal Guide took us scouting to stunning locations and told fascinating stories about Aboriginal culture. He took us to Gantheaume Point, which is a sacred ground where animal spirits lived. We found ancient Dinosaur footprints embedded into the rock. 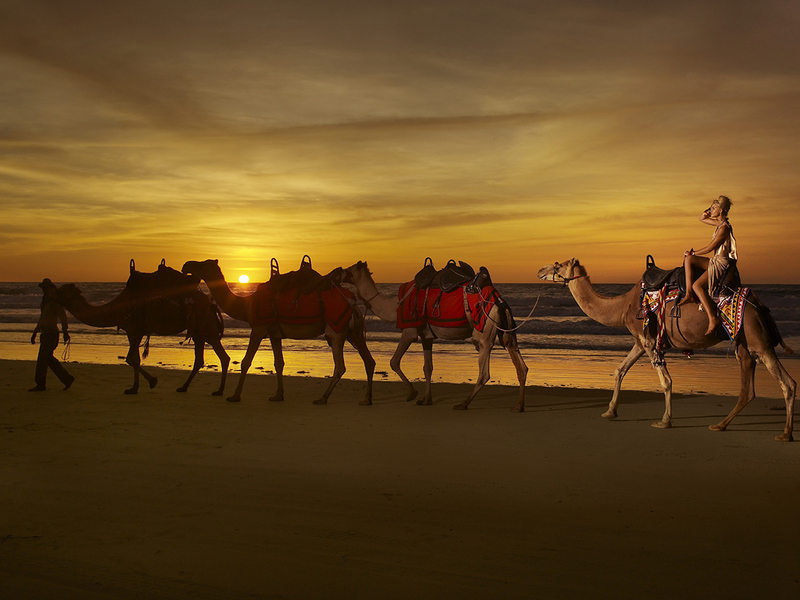 My favorite shots from this shoot are Sun Pictures, The Mallard and the Camels on Cable beach. I wanted to shoot cinematically, using a horizontal format. We used pools of light mixed with natural light to deepen the overall density and saturation. My favorite location was sun pictures, which is the oldest outdoor cinema in the world. It’s a type of outback Cinema Paradiso. It dates back to 1916 and is located in the Chinatown section. The fantastic old structure is full of old movie memorabilia and the seats are the original, old metal deck chairs from its creation. In the early days they used to have king tides (the water level rose 20 ft), so the water would cover the cinema floor and flying fish would jump in the air, in front of the screen. The audience where given buckets to put their shoes in and often the women were carried out on their date’s shoulder, to avoid getting their feet wet. Sun Pictures is magical and recreated in Baz Lurhmann’s film Australia. The mallard is technically a flying boat and the same one Howard Hughes flew. The Paspaley family bought two from America and refurbished them, to take journalists to the pearl farms. We were fortunate to fly over some of the most magnificent geography I’ve ever seen. Brightly colored reefs, horizontal waterfalls, where the water was pulled through huge cliffs rising out of the ocean, and then shooting the water back out horizontally. Mark and I were taken to the pearl lines by speedboat, where we each had the luxury of plucking our first pearl! We ended our day feeding the sharks from a speedboat. Which our team loved and will never forget. Cable beach has white powdery sand and turquoise blue water. It’s called Cable Beach, as there was once a telephone cable from Broome to Singapore. Broome is so remote, that Singapore is its closest major city. The idea was to have a type of Bedouin camel train, so we spoke to the local camel safari owner to organize the camels. However when we arrived, there was only one camel! …. Not really a camel train! He supplied us with three more camels, just as the sun was setting. It was a stunning way to end our story. The crew sat there with the sun turning from orange to red as it dipped down on the horizon, we were all feeling so very grateful for this fantastic adventure. Click HERE for my personal Top 10 things to do in Broome, Australia.